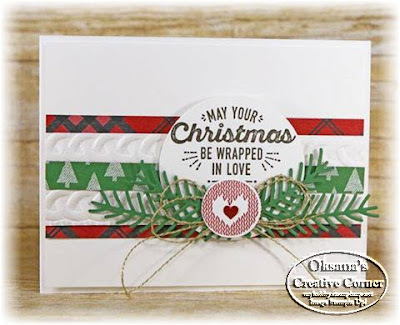 It was awhile since I blogged last time.Even so I was stamping, holding events - just no time to photograph and post. Die cut two small pines, two large pines from the Pretty Pines Thinlits and Garden Green cardstock. Stamp greeting onto Whisper White cardstock 2-3/4” x 2-3/4” using Early Espresso ink. Die Cut using Layering Circles Framelits (circle measures 2-3/8” wide). Attach to card front using dimensionals.